Whoever would have thought that oxygen could be dangerous? 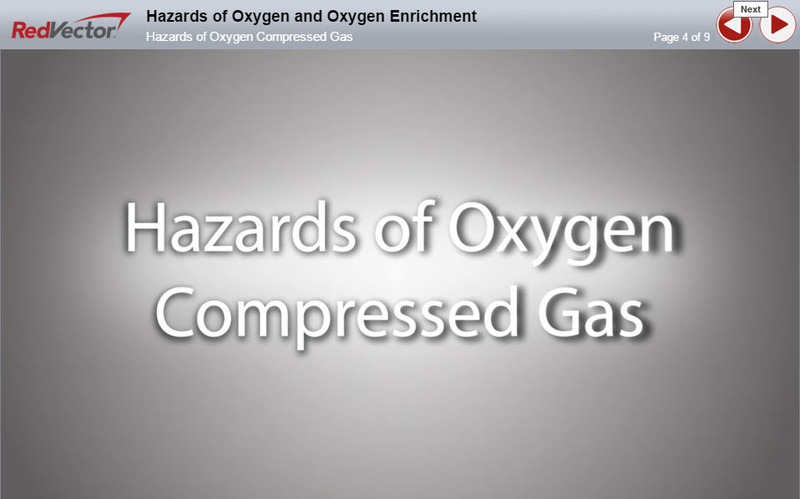 RedVector, a leader in online education, has just released a brand new course that will introduce and describe the characteristics – and hazards – of oxygen. This RedVector course will discuss the health hazards of O2 and how to detect oxygen deficient and oxygen enriched atmospheres. You will learn best work practices including handling and storage. By the end of this course, you will be able to list the potential hazards of Oxygen (O2), detect an O2 deficient and O2 enriched atmosphere, demonstrate proper handling/storage practices for O2 cylinders, and communicate training requirements for O2. Leading the discussion for The Hazards of Oxygen and Oxygen Enrichment is Certified Safety Professional Jon Wallace, who has over two decades of experience in the safety industry. Mr. Wallace has authored several courses for RedVector and has partnered with us to produce additional courses down the road. We are excited to offer this newest course and have many other exciting courses launching soon. Be sure to follow our blog and check us out onFacebookand Twitter to stay up-to-speed on all the latest eLearning news and course launches! For more information about this or other RedVector courses, contact our client support department today.